DIY Biking | How bike builds, bike travel and bike life can save the world: Does This Ring A Bell? 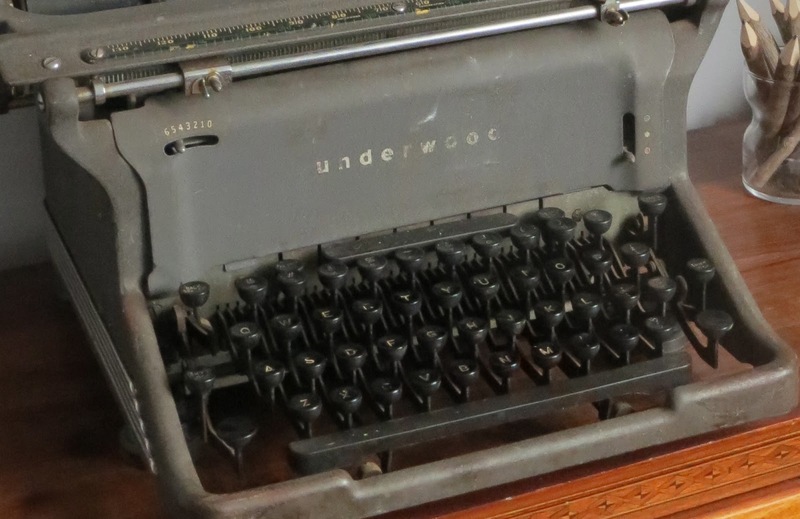 This is an FDR-era (probably) Underwood typewriter that belonged to my grandfather who died in 1989. Some time later, this typewriter, which had probably been unused for decades, migrated from his attic to my attic - where it probably would have been unused for decades more if I didn't accidentally come across the box it was in. Now I like thinking about my grandfather but this has no sentimental value to me because, well, I have no memory at all of ever seeing him using it. It also has no real monetary value either: if it was in excellent condition - which it isn't - it would probably fetch about $50 on eBay. It also has no decorative value since my wife has a smaller and more attractive old typewriter (which also performed a generational attic migration) that is fulfilling that purpose in our tastefully decorated guest bedroom. By the way, I know this is a biking blog but there is a connection coming. Stay with me. This Underwood, with no real value, was simply in my attic instead of his because it didn't have anywhere else to go. I decided that I would be able to honor my grandfather's memory by taking the typewriter apart. He liked working with his hands and did a fair amount of MacGyvering - though he probably didn't call it that - so I thought he would have appreciated the exercise. 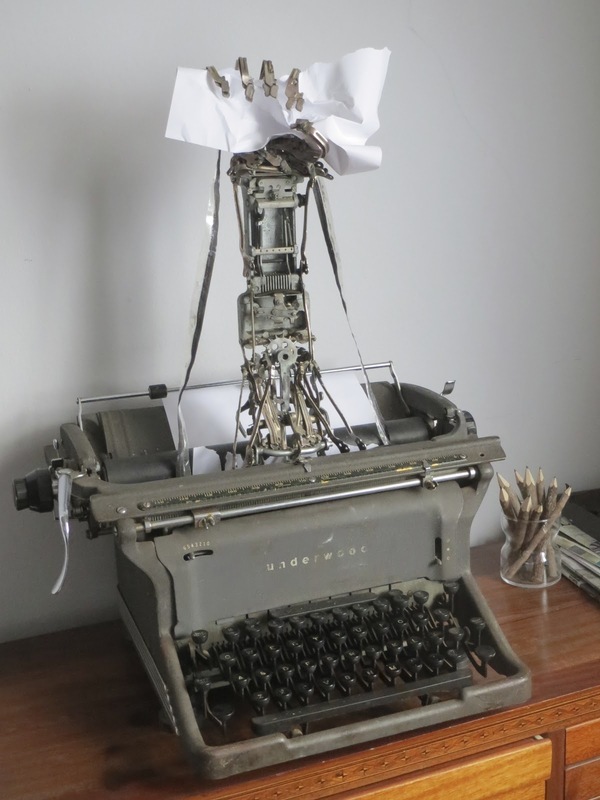 I have to tell you: if you ever have the chance you should take an old typewriter apart. It is Nerd-tastic. Geekalicious. Or some made-up word a character from The Big Bang Theory might use. I think about the writing people do now, only after searching for Wi-Fi and a power outlet and waiting for their machine to 'boot up.' To boot this up, you'd put one single piece of paper in it, make sure it was straight, and feed it through by turning a small knob. The tentative taps I make now on my MacBook Pro - I still feel like I may break the thing - would never have been good enough on the Underwood, with every word powered by the passion of the writer. To send Tweets back then, one would write on a slip of paper and throw it out the window. But you couldn't type a Tweet or anything else too fast, otherwise the keys would jam together. A fun bit of trivia here: the reason we have that ridiculous keyboard on our computers with the alphabet all jumbled up in the 'QWERTY' fashion? It was to separate commonly used letters; thus making it harder for the keys to jam together. That isn't a problem anymore but we still have QWERTY today. Tradition, I guess. I know this is a biking blog: stay with me. The carriage on the typewriter (which would move the paper from right to left) didn't advance properly when I hit the mostly sticky keys. But eventually I found a key that worked enough for the carriage to move…and when it reached the end I heard a 'ding' which would serve as a warning to the writer that they had reached the end of the page and would have to push the carriage back to the right and start on the next line. Back then writing was much noisier than it is now. But then again, one would never see a pop-up ad or an irritating, quasi-helpful paper clip appear, so there's that. I dug deep inside the typewriter and found the small brass bell bolted to the left side and a tiny hammer that would hit it and provide that 'ding.' Here I am holding the bell so you can actually see it. That 'ding' sound, which few people remember or will ever know, was a satisfying sound. So much so, that I decided that the bell needed to ding again. So one morning, while sipping coffee from my Ohio City Bicycle Co-Op mug, I looked in the 304 and pulled out my bells & whistles drawer. Yes, I really have one. One of the bells in there was broken but it was in there anyway: it had broken off of the A-bike (which is still recovering from the flat tire it obtained during Folding Bike Week 2011) and wasn't compatible with any other bike. I broke it again so I was left with a plastic base that had the little spring-loaded hammer on it. I then dug around another drawer that had bits from reflectors in it and found a piece that gave me what I needed. Then it was a matter of spending about $0.74 at the Rowayton hardware store on a brass bolt and a few nuts - a much better value than the dollar I spent earlier on the reusable Starbucks cup - and in moments I had this. This…is what I call a bike bell. I know I have a few of them in the bells & whistles drawer, but I had yet to put one on the new single speed, and since that bike was put together with stuff that was mostly lying around the shop, it seemed only fitting that it carry a bell that has an origin story. And because it is a bell that traveled more than sixty years in my grandfather's old typewriter before showing up on my handlebars, it is the coolest bell ever. And when some car dares to cross the margins/the white stripes on the side of the road or I need to make my presence known, I will make the bell go 'ding' and I will think of my grandfather. As this was very easy to make, I highly recommend that any cyclist who has access to an old typewriter make one on your own. A better fate than rotting in an attic. As for the rest of the typewriter, I took two keys that I carefully bent and a random piece of steel from within and made a business card holder. In my defense I did not use the keys that would have made my initials because I didn't know what I was making until I was done making it. Now I know this has also has nothing whatsoever to do with biking, but there's a connection coming: I entered 'No Words' into the Rowayton Art Center's juried exhibition, 'Expressions' on Monday. Yesterday I learned it was accepted in the show which has its opening reception this Sunday from 4:00 to 6:00pm. It also won 1st place in the sculpture category. So if you are free and can ride to Rowayton this Sunday afternoon - either from home or the Rowayton railway station - please do as I'd love to meet you and give a DIYBIKING.COM business card. There's your connection to biking. Thanks for reading and thanks for riding. What a great blog. I love your humour, and I love the sculpture too!